So why not - a blog post for 2019. I headed over to Niche last night, filled with apprehension that the Eater report of 45:00 waits and slow service was true. It was not, at least not when I was there: half the seats were free when I arrived, and everything I ordered was delivered promptly. This might be an anomaly, as the server remarked more than once how weird it was that they weren't busier. I got myself a can of wine and ordered the uni toast and the mazemen with clams. 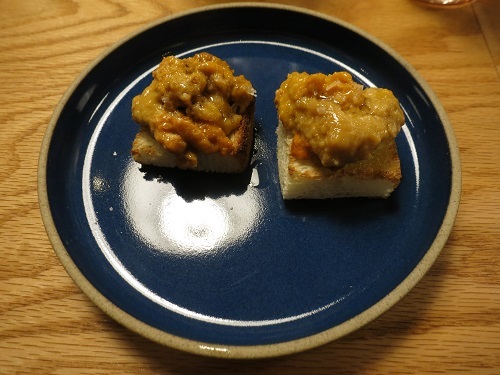 The uni was terrific, a generous portion of assertive-tasting uni (the way I like it) on squares of lightly toasted soft bread. Simple. Perfect. The Yuzu Dashi Vongole was...fine. 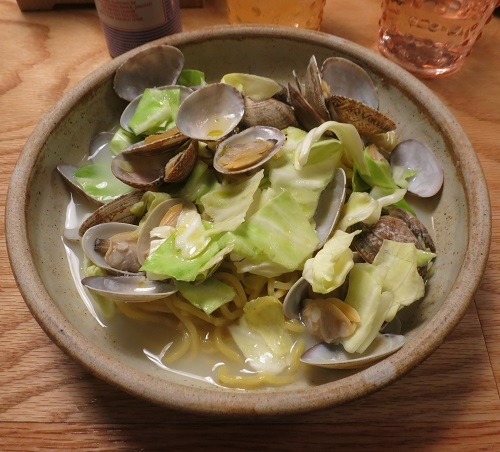 The noodles were excellent, but the clams were pretty bland, and cabbage is, well, cabbage. So mostly what I tasted was yuzu. Nothing wrong with yuzu, but I lost interest in the dish about halfway through (this did not keep me from finishing it). I was also not thrilled by my frequent encounters with shell shards. Someone in the back is knocking the hell out of those clams. I didn't think it was paid content, per se. I did think it was "let's post this press release as if it's an article that we wrote." Or "it was so nice that we were comped so much food - let's return the favor." I'm pretty sure it's paid content. How many slices can they have gotten comped? Whoa. That is some wall-to-wall coverage. I was thinking more along the lines of the Major Food Group places. I prefer to think that the little guys are pure, and Eater just wants to help them out! The little guys hire intermediaries who pay for the advertorials without even telling them they're advertorials, I think. So it's kinda like the girlfriend experience, restaurant version. The restaurant version of the girlfriend experience is restaurants. Was the major-domo doing the cooking last night - that wasn't our experience with the clam dish. Also, we may have a different variety of clam in the two dishes pictured? I didn't see the big cheese in the back - maybe he was next door. And the clams do look different in our respective bowls. Maybe I got b-list clams! Eh. They almost look like cockles, in the bowl you got. Paid content should be differentiated from editorial content, otherwise Eater (and Vox Media) are risking FTC fines as well as thorough embarrassment. There may be some fuzzy-edged quid pro quo,* but I would be surprised if the restaurants are booking and paying for those articles as native ads. Of course I could be wrong; but with my editor hat on, I just don’t see it being very likely. Are individual journalists being slipped wads of cash? I remember once being offered a bribe to get someone on the cover of a magazine. It was tempting, but I had to confess I didn’t control what went on the cover. Anyway, if that kind of corruption is systematic, it must be widely known in the restaurant world and the stories will one day surface. *Like access to Batali and open sesame to the kitchen at Otto to take a random example. Every time someone accuses them of pay-for-play in the comments section, one of the editors swoops in and categorically denies it. Eater has plenty of issues but I don't think blatant corruption is one of them.